With just a box label to go on, it can be very difficult to learn just what’s in your horse’s supplements and why it makes a difference. 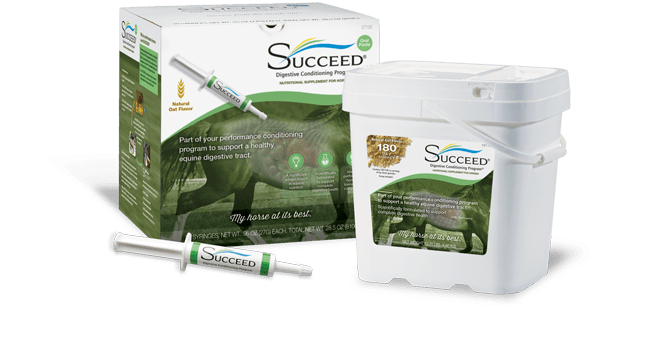 In Parts 1, 2, and 3 of What Goes In SUCCEED, we explained how equine supplements are regulated and how that affects our label, the benefits of Oat Flour in SUCCEED, and finally the benefits of Oat Oil in SUCCEED. In Part 4 we will discuss the benefits of the Irradiated Dried Yeast in SUCCEED (it’s the MOS). Subscribe to the blog for the final part of this series where we explore the synergy of all of the ingredients together. If you’ve been following along with this series, you probably understand that SUCCEED is so much more than what you see on the label. Just like with oat flour and oat oil, we have to follow state feed regulations and AAFCO guidelines when it comes to the yeast products in SUCCEED. The truth is, what appears on our label as “irradiated dried yeast” contains a lot more benefits than its name can give it credit for. The yeast products in SUCCEED contain different extracts of yeast. The first is Mannan-oligosaccharide (MOS) and the second is beta glucan derived from the inner cell wall of the yeast Saccharomyces cerevisiae. These yeast extracts are widely used in nutrition as a natural additives for the promotion of gastrointestinal health. Specifically, they support a healthy hindgut and natural immunity. The irradiated dried yeast in SUCCEED is also a source of nucleotides, which are the building blocks of DNA. Nucleotides in yeast support cell reproduction which is needed for building tissue. They are also shown to support the growth of intestinal cells called enterocytes. In turn, these benefits can positively influence overall wellness, energy levels, and performance. 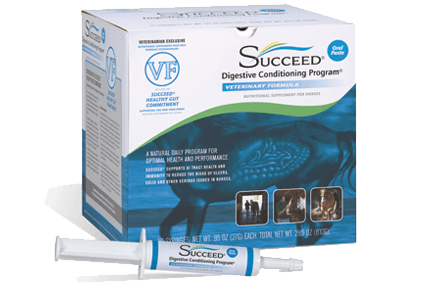 The SUCCEED difference is in the ways that we use MOS to give your horse the optimal nutrition that it needs. Because of our inclusion of irradiated yeast, your horse can maintain a healthy hindgut, leaving it healthy on the inside and performing at its best on the outside. The irradiated dried yeast is only part of the whole that makes SUCCEED what it is. Along with yeast, we’ve explored the benefits of oat flour and oat oil and found out that there is a lot more to the ingredients than what we read on the label. While we’ve seen the benefits of the ingredients on their own, in part 5 of What Goes In we’ll explore the process and benefits of our ingredients working together. Subscribe to the blog to see part 5 of What Goes In: The Synergy of SUCCEED’s Ingredients where we put all of our ingredients together (including the glutamine and threonine) to explain their natural activity and unique processing.